BAR HARBOR — People who pass by Hamilton Pond may have noticed it looks like a pond again. The stumps and vegetation that were visible until recently are back under water, signaling that repair work has been completed on the Hamilton Pond dam. The repair on the stone masonry dam was carried out in September by Harold MacQuinn, Inc. of Hancock. The work was commissioned by the MDI Biological Laboratory, which owns the pond and the dam. It was funded by private donations and by a $10,000 contribution from the Town of Bar Harbor, which uses the pond as a water source for firefighting. “The water level returned to normal within a few weeks of the repair,” said Mark Hanscome, MDI Biological Laboratory director of facilities. The project also involved improvement of the access road to the dam, and widening of the landing, which will provide easier access to the pond for fire trucks to pump water, Hanscome said. In a memo written in July, Fire Chief Matthew Bartlett called the pond “a critical water source for firefighting” in the Salisbury Cove area. “The immediate area covered by Hamilton Pond is 1,294 acres, 260 parcels of land, and 443 structures,” he says, which is larger than any other area in the town dependent on a rural source of water. The dam partially collapsed during a storm in February, after which the water level in the shallow pond dropped two to three feet. This made the pond unusable as a water source by the fire department, until the dam’s repair brought water levels back to normal. As well as being a fire reservoir, Hamilton Pond is also a popular skating pond and fishing spot. 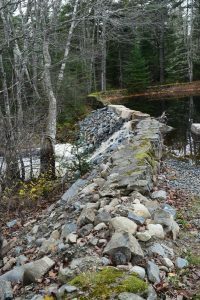 Harold MacQuinn, Inc. repaired the historic stone masonry dam in September, after a February storm had caused its partial collapse. Previous to the dam break, Hamilton Pond was known for its largemouth bass and chain pickerel. Burr said the pond had a self-sustaining fish population, and hadn’t been stocked by the state since the 1990s. The pond, which is located at the junction of Route 3 and Norway Drive, was created in the early 1900s when Stony Brook was dammed for agricultural purposes. 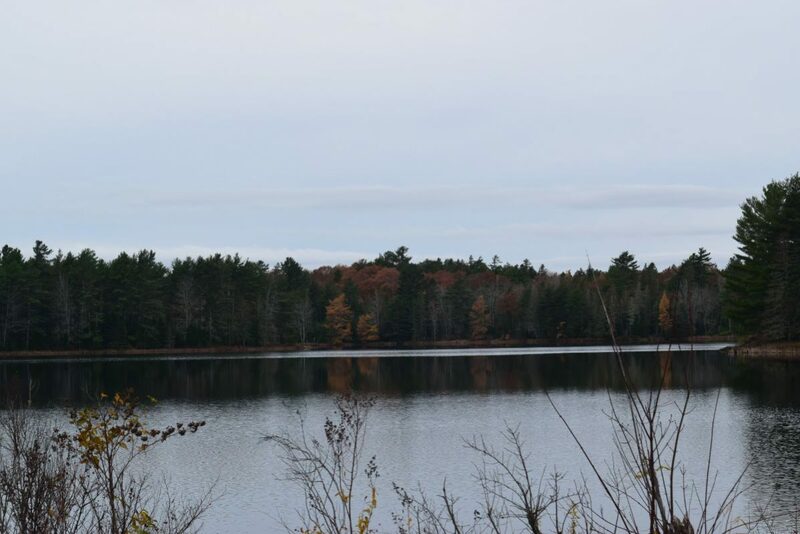 The property surrounding the pond was donated to the MDI Biological Laboratory in 1935 by John D. Rockefeller Jr. and his wife, Abby Aldrich Rockefeller. The MDI Biological Laboratory has started a fundraising initiative to support the long-term maintenance of the dam.